The 38th annual College All-Star Game in Chicago on July 30, 1971 featured the Baltimore Colts, defending champions of the NFL, against an All-Star squad coached by Blanton Collier, who had retired from the Cleveland Browns following eight years as head coach. The Colts, under Head Coach Don McCafferty, started 37-year-old Earl Morrall (pictured at right) at quarterback due to the unavailability of long-time star QB Johnny Unitas, who suffered an Achilles tendon injury during the offseason. The offense was typically more effective through the air than on the ground while the tough defense featured DE Bubba Smith, linebackers Ted Hendricks and Mike Curtis, and safeties Rick Volk and Jerry Logan. The All-Stars included quarterbacks Jim Plunkett, the Heisman Trophy winner out of Stanford, and Dan Pastorini of Santa Clara, FB John Brockington from Ohio State, Northwestern HB Mike Adamle, and WR J.D. Hill of Arizona State. The defense had hard hitters in DB Jack Tatum from Ohio State and DE Jack Youngblood of Florida, plus DT Julius Adams from Texas Southern, Grambling DE Richard Harris, and linebackers Jack Ham of Penn State and Isiah Robertson from Southern. There were 52,289 fans in attendance for the Friday night game at Soldier Field, which had undergone renovation that included a new artificial surface. The contest’s initial score was set up thanks to a poor punt by Dan Pastorini in the first quarter. It gave the Colts good starting field position at the All-Star 45 to start their second possession of the game, and they made the most of it. Earl Morrall threw to FB Norm Bulaich on a swing pass that picked up 17 yards and to WR Ray Perkins, who outmaneuvered Kansas State CB Clarence Scott for a 24-yard touchdown. Jim O’Brien kicked the extra point. On their next series, a holding penalty backed the Colts into their own territory and they were forced to punt. It looked as though the All-Stars would get nothing out of the ensuing possession when John Brockington was stopped for no gain on a third-and-one play at the Baltimore 40, but the Colts refused an offside penalty on the collegians, preferring to bring up fourth down. The All-Stars converted when Brockington ran for three yards to keep the series alive. Jim Plunkett connected with Mike Adamle for a 22-yard gain to the 15 and the collegians got another break when Plunkett threw for J.D. Hill and interference was called on CB Jim Duncan to move the ball to the one yard line. From there, on the third play of the second quarter, Brockington ran around right end for a touchdown. Pastorini added the point after to make it a 7-7 game. The Colts responded on their ensuing possession with Morrall throwing to HB Tom Matte for a 15-yard TD. O’Brien again successfully converted. With Pastorini at quarterback, the All-Stars advanced from their own 30 into Baltimore territory and Bob Jacobs of Wyoming kicked a 40-yard field goal with just over two minutes remaining in the half. The Colts moved well in the remaining time as Morrall completed six of seven passes for 102 yards, but they came up empty when O’Brien missed a 26-yard field goal try. The score remained 14-10 at the intermission. Baltimore’s lead was extended in the quiet third quarter when O’Brien was successful on a field goal attempt, this time from 22 yards. Early in the fourth quarter, the Colts appeared to take command when Morrall threw to TE Tom Mitchell for a 44-yard TD and O’Brien’s extra point put the pro champs ahead by 14. Sam Havrilak, normally a halfback but being tried at quarterback, relieved Morrall and on his second play, he botched a handoff to FB Tom Nowatzke and Jack Ham recovered for the All-Stars and ran 47 yards for a touchdown. It narrowed the margin to seven points, but proved to be the last gasp for the collegians, who were kept in check offensively as Baltimore held on to win by a final score of 24-17. The Colts had far more total yards than the All-Stars (403 to 150) and also had the edge in first downs (18 to 11). The collegians turned the ball over twice, to one suffered by the NFL champs. Earl Morrall, who played for a full three quarters, completed 20 of 30 passes for 329 yards and three touchdowns while giving up no interceptions. 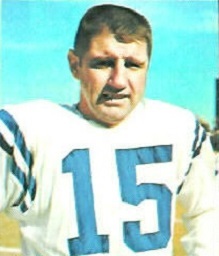 Norm Bulaich led Baltimore’s runners with 46 yards on 9 attempts. Tom Matte, who carried the ball 10 times for 18 yards, caught 5 passes for 63 yards and a TD, having great success on swing passes out of the backfield. WR Eddie Hinton also had 5 pass receptions, for 75 yards, and Tom Mitchell gained 95 yards on his four catches. 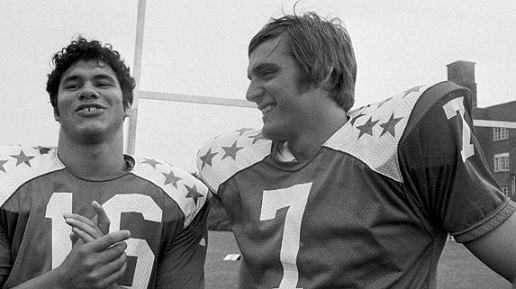 Jim Plunkett was successful on 6 of 15 throws for 65 yards and an interception and Dan Pastorini went two of nine for 13 yards and gave up an interception, although Pastorini led the All-Stars in rushing with 40 yards on two carries (Plunkett #16 and Pastorini #7 pictured below). John Brockington gained 27 yards on 12 rushing attempts that included a touchdown. Houston WR Elmo Wright, Mike Adamle, and J.D. Hill each had two receptions, for 25, 24, and 23 yards, respectively. The win for the Colts gave the pro champs a winning streak of eight games and a 27-9-2 edge in the series. It was the last of three College All-Star Game appearances for the club that reached the postseason again in 1971 as a 10-4 Wild Card but lost the AFC Championship to Miami.